Order this beautifull 18 x 24 poster for $10 per poster plus $3 shipping and handling per order (CA residents add 8.25% sales tax.) Mail to: Cathy Cade, 407 Orange St. #101, Oakland, CA 94610. 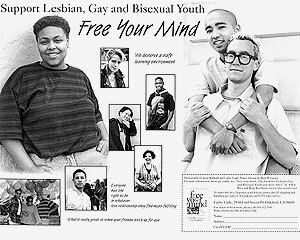 Free Your Mind: the Book for Gay, Lesbian, and Bisexual Youth-and Their Allies. Available from your local bookseller or library.